do crabs eat every day? i have noticed that my little guy always eats either during the night or in the afternoon, but some days i swear he just stops eating. do they eat and drink at a schedule? Crabs eat every day. Just like you do. But they eat in such small amounts, that it is hardly ever noticeable. Especially if you put in a lot, and only have a few crabs. If they are living, they are eating. And as long as you feed them a healthy varied diet you do not have to worry. ok, thank you so much! you are always a great help with my questions! btw is it common for a crab to rub his claws and legs together and clean his eyes whith his mouth? mine did that for 5 min yesterday... also, welcome salsa back! he came up from his first succesful molt and regenerated his leg segment! i am so happy! acorn went right up to him and they just looked at each other for a long time. then acorn climbed a branch and salsa tried to fallow him. LOL they are best freinds. hey overmountain1, nice profile pic! 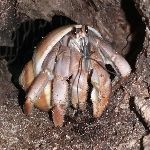 I feed my crabs every day or every other, and they most likely eat some of the food each time, but they won't eat if they aren't hungry. now i know how crabs groom themselves. it is really cool! also, i feed mine in medium amounts each day. even if they dont eat it, they always have a choice. I've never heard of this. They store water in their shells, and typically they drag food off and bury it for later.